Need some suggestions for “spider less” cranks (no chain ring bolts). I have been riding a SS for 5 years and the constant maintaince to quiet the chain ring bolts has run its course. +1. Very nice. Get a good bottom bracket to go with them such as a Phil Wood. i have ENOs on my 26in. they're great. if you want more options with chainrings, you can try XTR 95X. 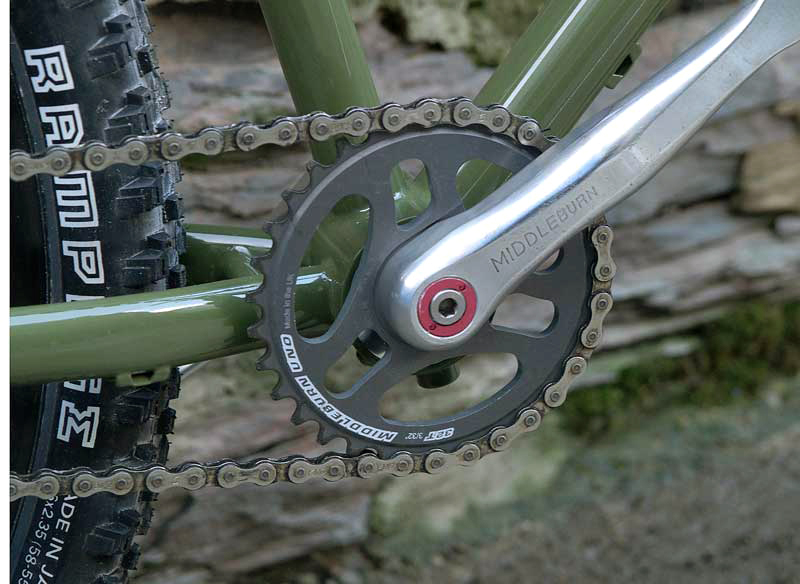 Middleburn RS7 cranks with Uno hardcoat chainring running on an SKF 600 series BB. Pretty much fit and forget. try a bmx crankset like Profile and a bmx sprocket. most bmx sprockets have thick teeth for a 1/8" chain, so look for narrow-toothed sprockets. Any cranks that do not use a square taper BB? BMX style cranks use a splined spindle, most commonly 19mm 48-tooth. they can be relatively light, and are incredibly strong. i use them on my dirt jump bike. shimano M952 XTR cranks use Octalink. 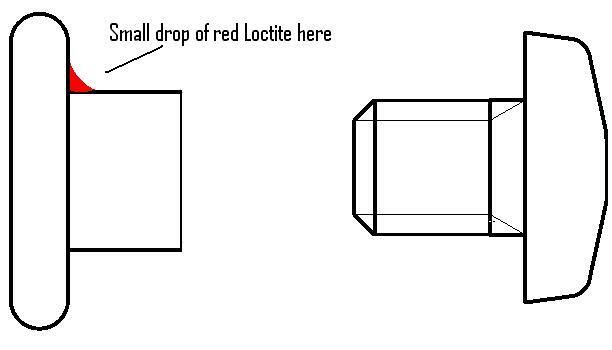 I find the red loc-tite to be the very easiest solution. It takes a blow torch to get the bolts off. Absolutely no squeaks, no slips, no errors. Well, its not like you have to melt the chainring. Just warm the ring bolts a bit, one at a time, and they pop off. You do need the special little wrench, I found a broad blade screwdriver just isn't the right tool for the job. My only initial problem was remembering that I had used the red loc-tite and needed to heat the bolts. More than a few grunts and groans on that day. Still, I think it's a bit excessive... To have to resort to a blow torch to change a ring. Why wouldn't you try blue loc-tite first? Last edited by Arek; 07-22-2010 at 05:57 AM. A mix of red and blue actually works very well. Use red on the external surface keeping the bolt from rotating and blue on the threads. Only a small drop is needed on both surfaces keeping everything tight. When you need to remove the bolt it comes off easily with a small blow from a rubber mallet. Blue Loc-tite works great for me! Small drop on the threads and I have had no problems. So is the problem here the chain ring bolts are creaking, squeaking & making noise or they are becoming loose and require frequent tightening?? That sounds like a good idea, no red on threads. Becoming loose and then making noise. There is a lot of torque on those little bolts. Do you guys put any grease on the outside of the bolts? Blue lock-tite on the threads and steel, or stainless steel, bolts and have never had an issue. Make sure all of your surfaces are clean before you put everything together. A lot of shear on the bolts, but not that much torque or tension. Yeah... interesting to me to consider loctiting these bolts. In 40 years of avid cycling (and doing my own wrenching) I've never loctited them... just always applied grease and torqued them well. During this time I've never lost a CR bolt nor had one loosen. Yes, as a matter of fact I do ride hard, and with 195mm cranks + 200# rider I know I put a lot of stress on these bolts. Not saying people shouldn't employ loctite for CR bolts, only offering another rider's experience. P.S. Perhaps one more consideration worth noting: I've never owned a 4-bolt crankset. With 5-bolt spiders I suppose my rigs enjoy 20-25% less load on each CR bolt... just sayin'. I use five bolt exclusively- and they are harder to find than I would like, but it is worth it- losing bolts in the forest is never good, and bending a chainring five miles in because of that is even worse. I grease and then tighten down, and from time to time, they'll get loose. But 5 bolt gives me a heads up before **** hits the fan.